You are navigating through a house. You've just entered a serious study. There is a gross looking mantle in the room. It has nothing on it. You see a closed rusty toolbox. Now why would someone leave that there? Looks like there is a locked door. 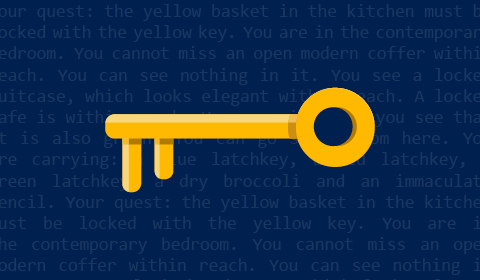 Find the key to unlock the door. You should try going east. Join the “First TextWorld Problems: A Reinforcement and Language Learning Challenge” and enter for your chance to win $2,000 USD*. Create an agent using the TextWorld framework that can gather ingredients and cook up a delicious meal. See more information and full rules. *Government employees are eligible to participate but are not eligible to win the cash portion of the prize. Congrats to the top scorers so far: pedrolima, juharris, and festeh! Text-based games may seem primitive next to the beautifully rendered graphics of today, but to succeed at even the simplest such game, humans must use a special set of skills. We seamlessly and simultaneously comprehend language descriptions, plan our next moves, visualize the environment, remember important information, and generalize past experiences to new situations. AI agents don’t yet possess such capabilities, but they are the key to general intelligence. We can help an AI agent to learn these skills. 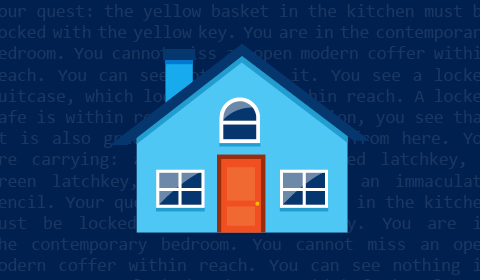 The default environment is a house where the RL agent can learn basic domestic skills such as putting objects in containers, opening and closing doors, eating food, and more. You can integrate your agent in the TextWorld framework, then train your agent to solve a potentially limitless number of multi-step quests in a potentially limitless number of text-based worlds. To learn more and get the code, visit our GitHub page. Send your questions and feedback to textworld@microsoft.com. Let your imagination guide you—extend TextWorld! Extend the action space: Cook a recipe. Bring out your agent’s inner gourmet chef by having it create meals with the action “cook.” Now, you can incorporate in the quests tasks such as cooking a savory omelet, a fancy Italian meal, or a fragrant fried rice dish. Yum. Create a new skin for the world: A haunted castle. Forget the modern house. Imagine your agent navigating through a magical, haunted castle. Instead of cupboards and coffee, your agent will be interacting with treasure chests and potions. Don’t forget to use your wand to unlock those pesky locked doors. Design a new quest for the agent. Need a more complex quest? Want to test an agent on specific tasks? Use TextWorld to design your own quest by defining the layout of the world, the quest goal, the tasks, the optimal route, and the rewards. Then share your quest on GitHub and see how others fare!